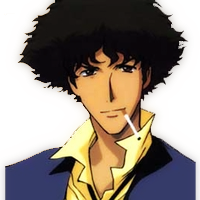 Spike Spiegel (ã‚¹ãƒ‘ã‚¤ã‚¯ãƒ»ã‚¹ãƒ”ãƒ¼ã‚²ãƒ« Supaiku SupÄ«geru?) is the central protagonist of the 1998 anime series Cowboy Bebop. Spike is a former member of the criminal Red Dragon Syndicate, who left by faking his death after falling in love with a woman called Julia. He is first introduced as the partner of Jet Black, captain of the spaceship Bebop: the two are legalized bounty hunters pursuing criminals across the populated worlds. During his adventures on board the Bebop, he is drawn back into a bitter feud with Vicious, a rival from the Syndicate who seeks to kill him. » Effects: -50% handgun damage. Below you can view the profile image you currently have set for your character and if need be change the image. Large images will be resized automatically. Copy/Paste the URL for your new profile image here. Tool to edit your character's biography, please note that biographys are limited to 2000 characters (a-z, 0-9, etc). If you have any questions please visit the ( help forum ). Below you will find tools that allow you to edit your basic character information like height, weight, email, etc. Some fields will be disabled and can only be changed upon request of an admin. If you have any questions please visit the ( help forum ). Below you will find the tools that allow you to swap out your characters equipment. Please remember whenever you by equipment from the ( bebop boutique ) they will be added to your profile here, where you can then freely swap as you see fit. Also remember different equipment effects stats differently, you may notice changes to your characters stats after equipment swapping. If you have any questions please visit the ( help forum ). » Current Effects: -50% handgun damage. Welcome to the Chimera Engine demo page! Please be reminded that the Chimera Engine is in active development and this demo among other demo pages will be made available as they are completed. The page you are viewing now is the Jupiter Jazz profile page, please feel free to edit any of content so you can see how players will be able to login and edit their profiles as they see fit, in real time. As of now the equipment section is currently not done, so editing it will not have any results.